Principal of Harrogate's Grove Academy, John Warren. Residents are being urged to help protect the future of a Harrogate school which supports some of the most vulnerable young people in the education system. North Yorkshire County Council has decided to stagger a cut to the budget of Harrogate’s Pupil Referral Unit, The Grove Academy, which takes students who have been excluded from or cannot be taught in mainstream schools. But teachers at the Academy have warned that the changes do not go far enough and that the cut must be ‘completely quashed’ to prevent a forced closure of the school. Head of English at the Grove, Alex Boyce, said: “We are glad that the council have acknowledged how unreasonable their original proposal was but the revised proposal is no different. “The revised proposal simply breaks the huge cut into two phases - the result would be just as devastating for young people and the community. An Outstanding service would be lost. 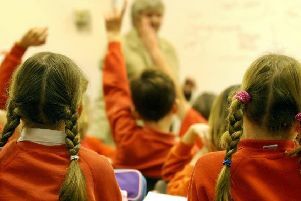 The council says that it must address a £5.5million blackhole in its educational ‘high needs’ budget. To do this it proposed to remove all of its ‘discretionary funding’ to the school in April, slashing the Grove Academy’s budget by 83 per cent. But following widespread concern from the community, the Council has agreed to push back the cut to September 2020, and only pay half of its discretionary funding until then. The Council originally stated it would also reduce the funding per pupil from £19,000 to £17,000, but has since amended this reduction to £18,000 and has delayed this cut until this September. NYCC’s Executive Member for Education and Skills, Councillor Patrick Mulligan said the delays and reductions would ‘reduce the impact’ of the changes on the pupil referral service. Harrogate County Councillor Geoff Webber has urged residents to lobby their county councillors for a ‘stay of execution’ against the plans. He said: “North Yorkshire’s answer to a £5million overspend on the high needs budget is to cut funding on the only way we have of currently dealing with these children. But Coun Mulligan insists the service is ‘generously overfunded’. He said: “We need to bring the funding per place for permanently excluded young people into line with national rates. "We also propose to shift some of the discretionary funding used for prevention work by the pupil referral service to school-led locality based partnerships so they can have a greater say as a group as to how this funding is used for their area. “The high quality of our pupil referral service in North Yorkshire is not in question - this proposal is about putting children first by tackling the significant rise in exclusions.